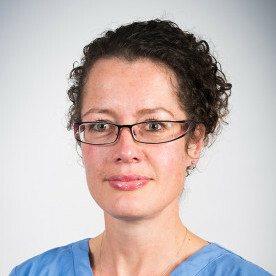 Sarah graduated from Massey University, New Zealand in 1995 and spent five years in mixed practice before joining the staff at the University of Liverpool where she held the position of surgical resident and was part of the first UK team to perform total elbow replacements. Sarah gained her certificate in small animal surgery in 2003 and recently the European College of Veterinary Surgeons diploma in surgery (2007). She is a European Specialist in Small Animal Surgery. Sarah has been an active contributor to the orthopaedic and soft tissue surgical training of students and colleagues through continuing education courses run at Liverpool University and with CPD Solutions. Sarah enjoys all aspects of small animal surgery particularly orthopaedics preferring neurological investigation, lameness evaluation, arthroscopy and fracture management.